A Christian minister and a Hindu monk fall in love and get married. How does this interfaith relationship work? 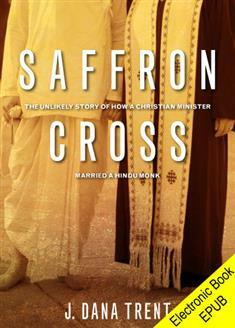 Saffron Cross is the intriguing memoir of the relationship between Dana, a Baptist minister, and Fred, a devout Hindu and former monk. The two meet on eHarmony and begin a fascinating, sometimes daunting but ultimately inspiring journey of interfaith relationship and marriage. Dana's compelling vignettes, laced with self-deprecating humor and refreshing honesty, give you a glimpse into the challenges and benefits of bringing together two vastly different spiritual paths into one household. Saffron Cross includes chapters on Dana and Fred's honeymoon at an ashram in India, their individual spiritual journeys, Sabbath keeping, vegetarianism, grief, community, and more. You will sense what an adventure their East-meets-West partnership has been, and you'll also see how much Fred's commitment to his faith has enhanced Dana's Christian growth. At a time when we are inundated with messages of intolerance and hate, Saffron Cross offers a welcome and inspiring story of empathy, love, and understanding.